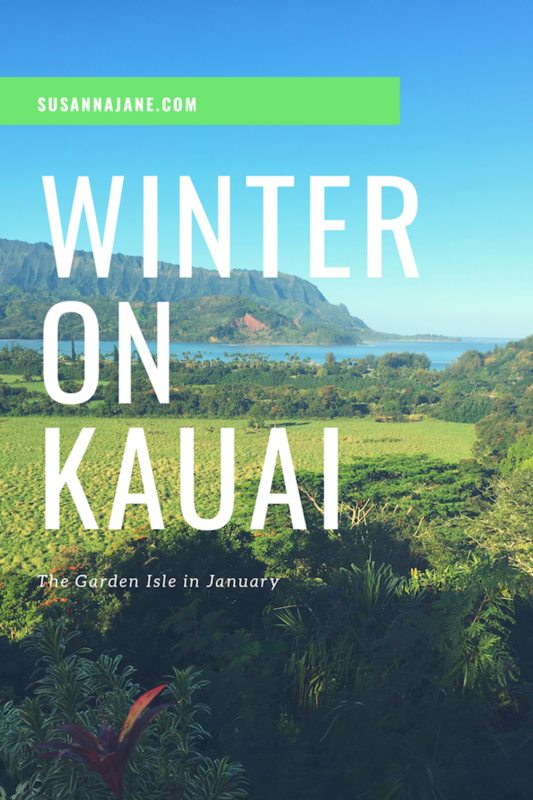 Spending a week on Kauai in January can go a long way towards curing the winter blues. In fact I loved it so much, I’m trying to figure out how to make it happen every January. January falls in the rainy season on the island; but generally, if it’s raining on one side of the island, you can go to the other side to find the sun. The south side tends to be less rainy than the north. We stayed on the north side and were fortunate to only have rain one day. Kauai can get a lot of rain; there was flooding last April, from which the island has still not completely recovered. At the time of writing this, the highway is still closed west of Hanalei, making some places unreachable. The bright side of the rain is the abundant waterfalls. Whale season peaks January through March, so in my opinion, that’s an excellent reason to go in January. I enjoy staying at a cool hotel every now and then, but I really like staying at an Airbnb or VRBO and living like a local. If you have never stayed at an Airbnb, I highly recommend it; here’s a $40 credit for your first stay. In addition to feeling more like a local, rentals are generally less expensive than a hotel, especially if you take advantage of having a kitchen and at least dine in for breakfast. We stayed in Princeville at this amazing house. It was perfect for six people and had lots of extras like beach and snorkeling gear. There is bus service to some areas, but getting around is much easier with a rental car. We rented an Enterprise car through Discount Hawaii Car Rental. I checked several aggregate sites, as well as the rates to book direct with the car rental companies; Discount Hawaii Car Rental always had the best rate. The trick is to book early and keep checking back; I cancelled and rebooked several times over the course of several months. I think I could have saved a few dollars by booking with someone other than Enterprise, but after looking at the reviews, I decided I didn’t want to risk wasting two hours in line. The Enterprise shuttle takes you to the nearby off-airport location and the process for renting went smoothly. Everyone there was incredibly friendly and helpful. I’m the kind of traveler that likes to do a lot of research during the months leading up to the trip. This helps me pinpoint the places that I don’t want to miss. I created this map prior to the trip plotting places of interest. It was incredibly helpful; when we were visiting a high priority place, we would consult the map and see what else was nearby. I will create a map for every trip I take from now on. I don’t like to have a rigid itinerary and am perfectly happy flitting from one place to another, the map helped us make the most of our week on the island while remaining flexible. 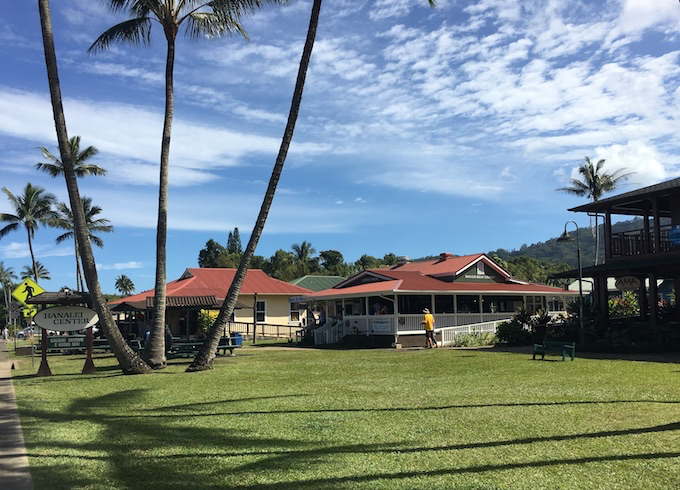 Hanalei, a small beach town, is a short drive from Princeville. There are lots of choices for dining and souvenir shopping. I loved the feel of Hanalei. We ate several meals there, including checking out some of the food trucks. We also took a Ukulele Lesson at Hanalei Strings. That was my first time doing an experience with Airbnb and will definitely be checking out experiences when I travel. 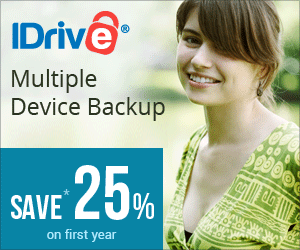 You can get $15 off your first experience of $50 or more with this link. The lesson was a lot of fun and has inspired me to pull out my uke and practice again. 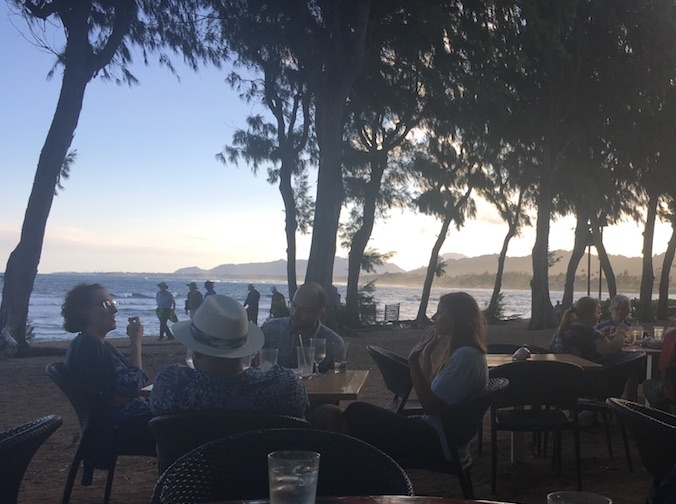 My other favorite places in Hanalei were: Hanalei Beach; Hanalei Chocolat; Hanalei Taro & Juice Co; Trucking Delicious; and exploring all the shops and restaurants in Hanalei Center. Queen’s Bath is a natural tidal pool and is located very close to the house where we stayed. There is a hike to get down to Queen’s bath. For some reason, I had been under the impression that there was a way to see Queen’s Bath from further away, without the hike. Having been there, I don’t think that’s possible, except maybe by helicopter. The hike is a little steep and can be really muddy; if you aren’t into hiking, I would probably skip this one. During the winter, the tide is really strong and you definitely do not want to swim. In fact, after we went, we learned that a girl had died there in December when a wave washed her off the rocks. We did not get very close to the water. Before going, check the tide charts to avoid high tide and be very cautious about getting too close to the water. I saw the Napali Coast by helicopter when I went to Hawaii as a teenager. I was excited to see it by boat this trip. 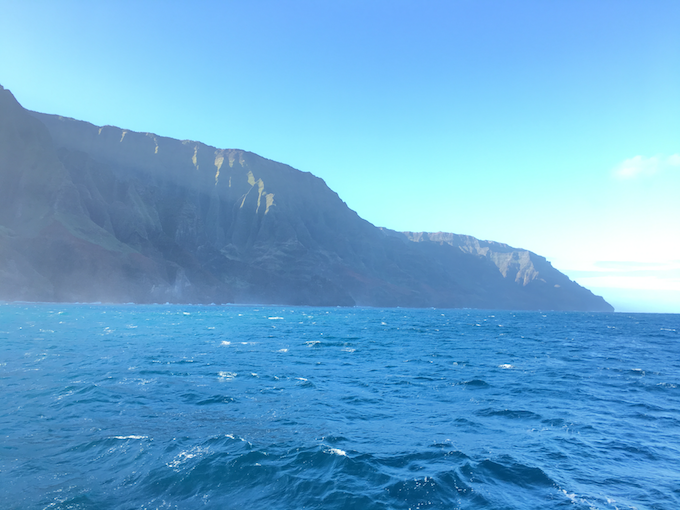 We pre-booked the the Napali + Niihau tour with Blue Dolphin a few weeks before the trip. Blue Dolphin guarantees dolphin sightings and during whale season, all tours are whale watching tours. The water was a little choppy so they cut the tour short and did not go to Niihau. The captain said that the water was so choppy the previous day that they cancelled the trip all together. For this reason, I would probably book boat trips for earlier in your vacation. If it’s cancelled, you may be able to reschedule for another day. We saw a few whales from afar and even saw one whale breach the surface. Since we did not stop in Niihau, they stopped the boat on the way back for some snorkeling. There was a buffet lunch including Mai Tais. I would love to do the Napali hike someday. At the time of writing this, you still cannot access that area due to the flooding. I also saw Waimea Canyon by air on my previous trip. I wanted to see it up close this time. The drive up to the lookout was steep and winding (probably not great for someone that gets car sick). We stopped at the Red Dirt Waterfall on the way up the canyon. The Red Dirt Waterfall was pretty, but a lot smaller than I expected. The red dirt looks just like I imagine Mars looks. Waimea Canyon was beautiful. Be sure to look for waterfalls! 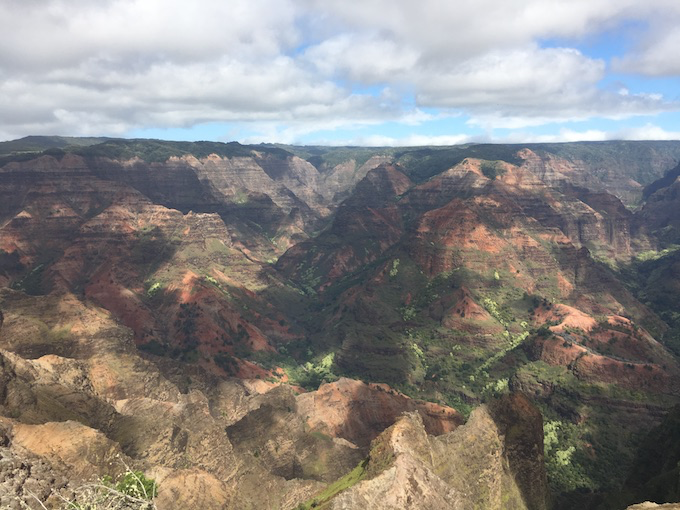 When I make it back to Kauai, I would love to do the Canyon Trail Hike. If you know me very well, you know I’m just a bit obsessed with coffee. I love good coffee and was excited to see it actually growing. Having grown up in a small farming community, it was interesting to learn about how it’s harvested. We watched a film about the entire process, taste tested a lot of the varieties, took a self-guided tour, and even had some coffee ice cream. 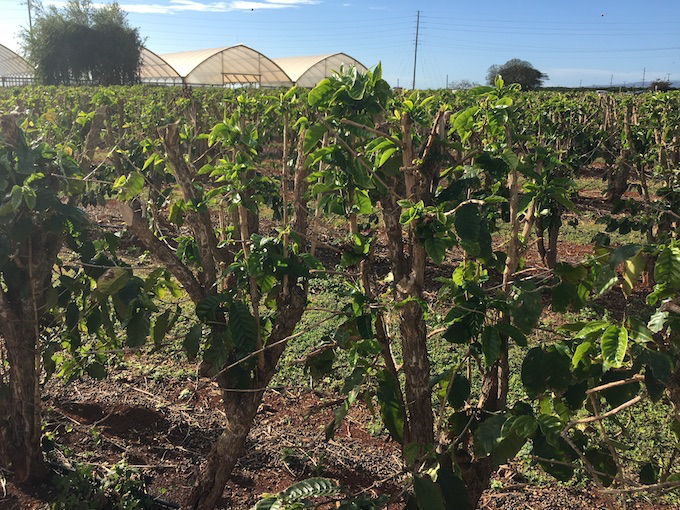 From seed, it takes 4-5 years for a tree to begin bearing coffee cherries. The lifespan of a tree is 40-50 years. The berries are harvested once a year and one tree provides one pound of coffee. I bought two varieties and really like the Polihale Sunset. Next time, I’ll leave more room in my suitcase to bring more home. 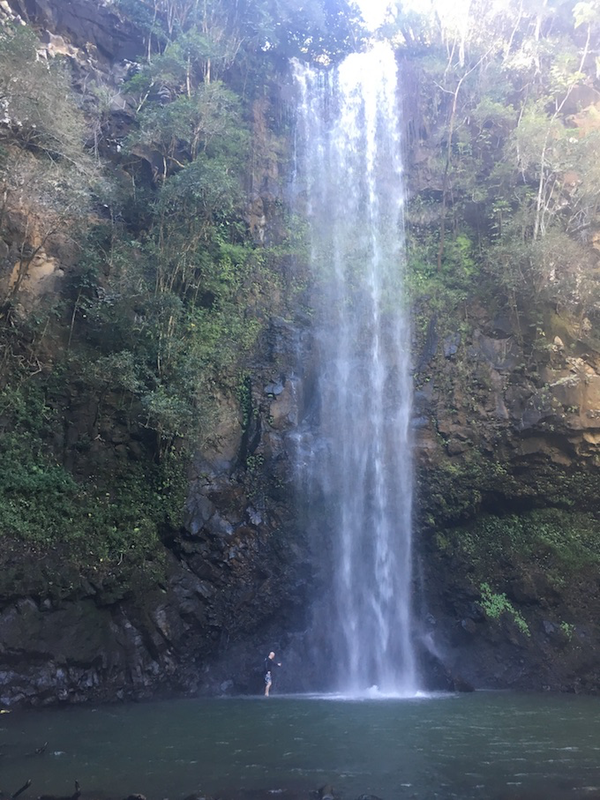 I think my favorite activity in Kauai was our canoeing and hiking trip to Secret Falls. We went on Sunday when none of the tour groups run. I believe that Kamokila Village is the only place on the Wailua River whose canoes are already on the water, so you don’t have to transport them. We made the short canoe trip from Kamokila Village to the trail and hiked to Secret Falls. When we began the hike on the simple dirt path, we were thought that it was going to be a simple hike. The further we got, the muddier it got; the mud combined with lots and lots of roots, made for a more difficult hike. There was a pile of sticks at the start of the trail (which we later figured out were walking sticks discarded by those who’d completed the hike). We eventually found our own walking sticks which helped a lot. We began the hike late in the morning, so by the time we were finished we were pretty hungry and skipped Fern Grotto. If I were doing it again, I would pack a lunch and eat at the Falls. 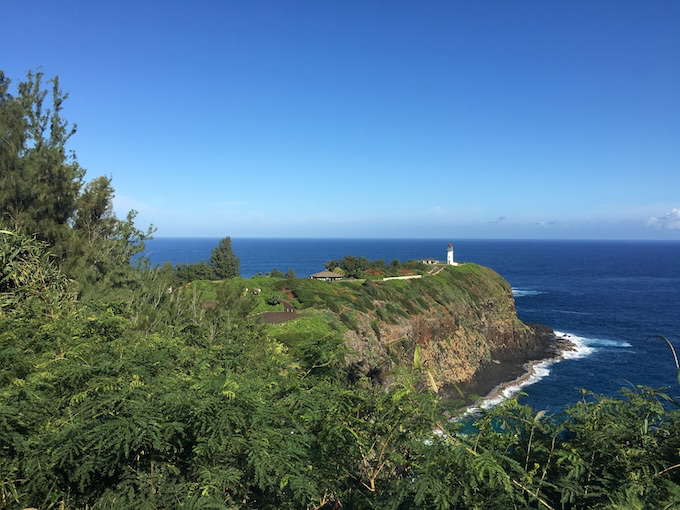 The Kilauea Lighthouse was not at the top of my list, but I’m so glad we went. We were under the impression that it was closed because my friends went on another day and couldn’t get in. They went on Sunday, so I think it was just closed for the day. We completely lucked out and happened to arrive at the lower observation area a few minutes before 10:00 a.m. (when they open the gates to go up to the lighthouse). We decided to get in line and drive up to the upper level. It cost $10 to get onto the grounds. I don’t believe the actual lighthouse was open, but we saw a lot of whales while we were there, so the $10 was completely worth it. I would check the hours before going and try to get there around they time the gates open. When we left, there was a huge line of people waiting to drive up (they will not let you walk from the lower parking area). I would be remiss if I wrote a post about Kauai and didn’t mention the food. Frankly, my favorite meals were from food trucks. The toes-in-the-sand experience of Lava Lava Beach Club was fun, but the food was just okay and the service wasn’t great. For the price, I’m not sure that it was worth it. I think the best restaurant meal I had was at Hideaways Pizza Pub. I had the Garden Island Pizza to eat and The Moment to drink; both were superb. I recommend concentrating on the food trucks and dining al fresco. My favorites were: a lobster poke bowl from Trucking Delicious; a taro burger from Hanalei Taro & Juice Company; and a kalua pork covered hotdog from Porky’s. 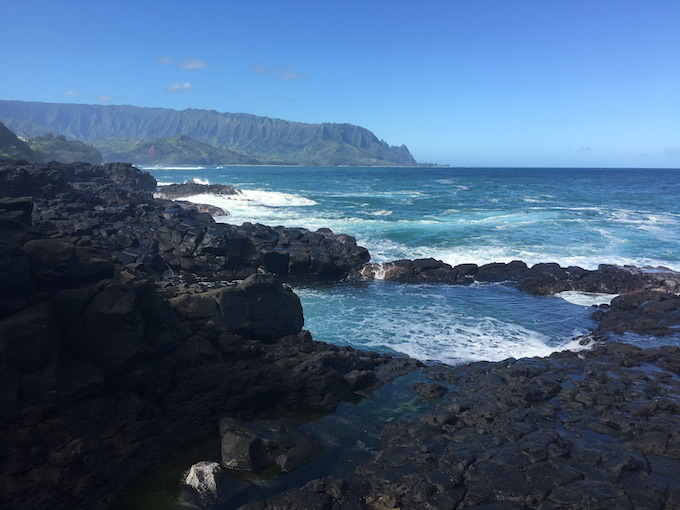 Kauai is an incredible place to go in January. The scenery is amazing and the people are among some of the friendliest I’ve ever encountered. 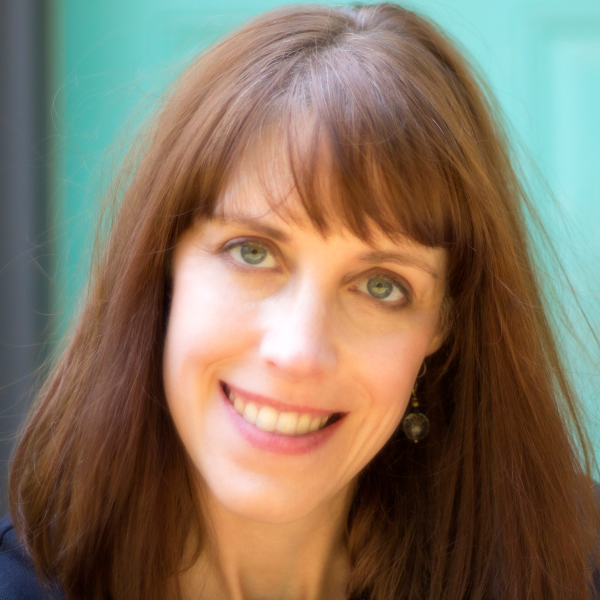 Tomorrow, I’ll share my packing recommendations.